Theodore ("Teddy") Roosevelt served as the twenty-sixth president of the United States from 1901 to 1909. A writer, explorer, and soldier, as well as a politician, Roosevelt distinguished himself as president by advocating conservation of natural resources, waging legal battles against economic monopolies and trusts, and exercising leadership in foreign affairs. An energetic man with a colorful personality, Roosevelt later sought to reclaim the presidency in 1912 as the head of the Progressive Party. "No man is above the law and no man is below it; nor do we ask any man's permission when we ask him to obey it." After leaving office in March 1909, Roosevelt spent ten months in Africa on a hunting trip and then visited Europe. Upon his return to the United States in 1910, he was shocked at Taft's capitulation to the conservative Republicans in Congress. 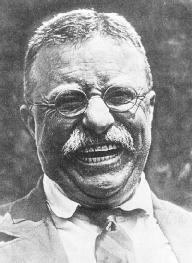 His animosity toward Taft grew, and in 1912 Roosevelt declared his candidacy for the Republican presidential nomination. Although he won most of the primaries, the Republican Party leaders controlled enough votes to give the nomination to Taft. Undaunted, Roosevelt formed a third party, called the Progressive Party. Following a failed assassination attempt against him in Milwaukee, Wisconsin, in October 1912, he said that it would take more than that to kill a bull moose. Thereafter, the Progressives were nicknamed the Bull Moose Party.